To enter this compartment you must step through the first of seven water tight doors that separate Cod's eight major hull compartments. These doors allow the compartments to be isolated from one another in the event of damage to the submarine resulted in flooding. Cod has sufficient buoyancy to surface with any one compartment flooded. Under the deck there are 126 lead/acid battery cells, each of which is 21.5 by 15 inches, stands 54 inches high, and weighs 1,650 lbs. Each cell holds 48 gallons of electrolyte. These cells provide half of the energy storage capability for running submerged (the After Battery Compartment, located below the main crew berthing compartment, has the other 126 cells). 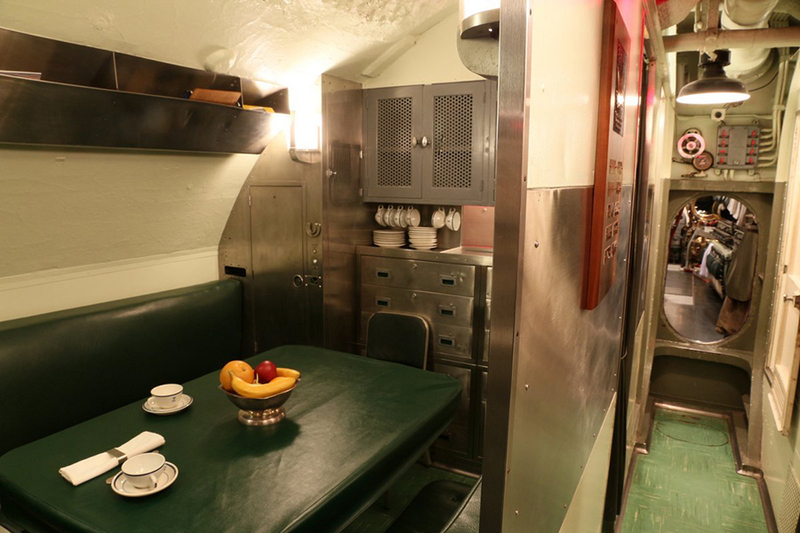 Above the deck in this compartment are the officers living quarters. 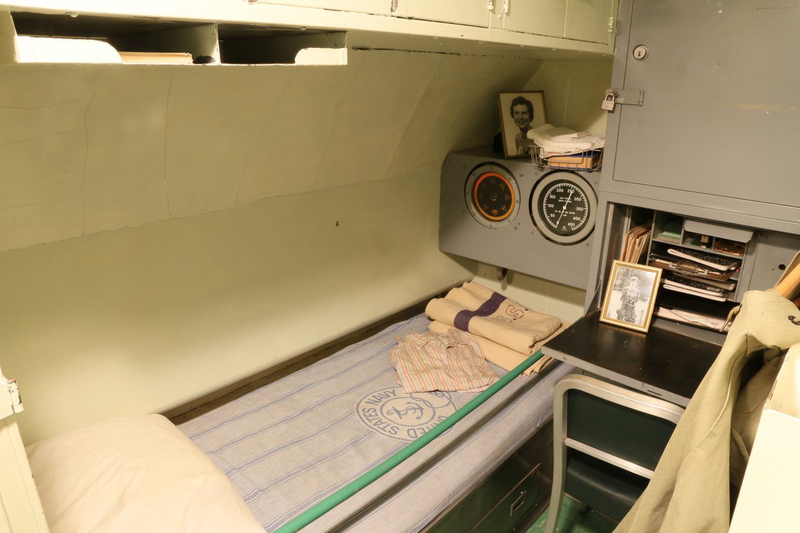 The officers each have their own bunk and do not have to "hot bunk" (sleep in rotation on one bunk) like some of Cod's enlisted men. Except for the captain the officers sleep two or three men to a stateroom. The captain has a private room, which is easily identified by the gyrocompass repeater and depth gauge at the foot of his bunk. Each stateroom has a fold-up sink, drinking glasses in bulkhead holders, a medicine cabinet, a writing desk, drawers and cabinets, a chair or fold-down bench, a red bulb reading lamp (to preserve night vision), a wastepaper basket, a white light fixture, a fan, a clock, and a privacy curtain across the door. The captain's cabin also has call bell buttons to signal the yeoman's shack and the pantry, as well as a battle telephone and gauges that indicate the submarine's depth and heading. Also located in this compartment is the small pantry where the mess stewards would serve food prepared in the main galley. The tiny pantry holds a small oven, a refrigerator, a dual-burner Silex coffee maker, a sink, china cabinets and drawers, a four-slice toaster, and a fold-down bench seat. Across the companionway is the shower for the officers. The Ward Room is found on the port side just aft of the pantry and serves as the officer's mess and general meeting space. The wardroom also provides storage for Cod's navigation chronometers, navigation charts, wardroom silver service, books and manuals, game equipment, an RBO radio receiver, and a record player. Two additional bunks can be rigged on the port side of the wardroom table to berth additional officers. The Cod crew included at least two stewards, whose main job was to wait on the officers, make their beds, and clean up the compartment. Meals for the officers were prepared in the main galley and brought to the pantry for serving. Aboard U.S. submarines officers eat the same high-quality food as the enlisted men. In preparation for meals the expandable wardroom table is covered with a white linen tablecloth. Place settings include the traditional U.S. Navy "King Neptune" pattern silverware, table silver service, and the Navy's "fouled anchor" patterned china. Officers are expected to dress for meals, which in the hot tropics often means they put shirts on over their teeshirts. Located at the after end of this compartment on the starboard side is the telephone booth-sized ship's office called the "Yeoman's Shack." 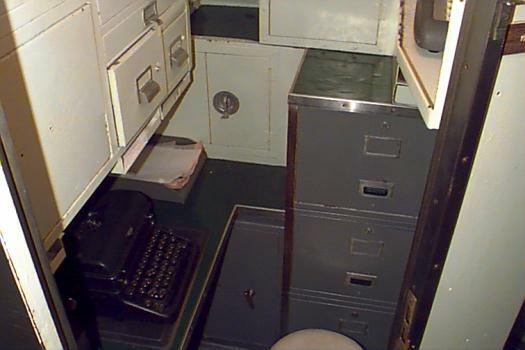 The yeoman would be very busy during the last week of a war patrol preparing a 100-plus page narrative of the patrol in triplicate on the manual typewriter in this tiny space. At the after end of this compartment on the port side is the Chief's Quarters (known as the "goat locker" in enlisted men's slang). The five bunks in this stateroom were shared by the chief petty officers who ran the various departments on the boat.